These are Sviatoslav Richter�s first recordings for the BBC. He was at the height of his powers in the early 1960s. Perhaps the most commanding pianist of the 20th century, Richter had no peers concerning sonority, rhythmic flow, tone/touch, and the ability to greatly alter indicated tempos without depriving the music of the emotional content intended by the composer. There are currently many dozens of Richter recordings on the market. The newly released BBC recording has one main factor to its advantage � the most compelling "Carnival Jest from Vienna" on record. It even bests Richter�s acclaimed version on EMI. Further, all of the other performances on the disc are exceptional, although the listener will have to deal with sound that is rather recessed and murky. Beethoven�s Sonata in E major (2nd Movement Allegretto) � One of Richter�s trademarks is his wondrous ability to play music at extremely slow tempos that in the hands of any other pianist would destroy the musical flow. So it is with Richter�s six-minute traversal of the 2nd Movement. This dangerously slow pace is just half the speed of most other recorded versions, and I simply marvel that Richter not only succeeds but also trounces the competition. In this Allegretto the two-octave leaps, which are so prevalent, play a major role in the music's poignancy and rhythmic foundation. Richter doesn�t pay much attention to them, as he reshapes the music almost into a hymn-like structure of great melancholy and regret. The effect is mesmerizing and places the performance ahead of a typically paced version such as the exceptional one by Rudolf Buchbinder on Teldec. Buchbinder certainly makes the most of those octave leaps. Beethoven�s Sonata in G major (2nd Movement Andante) � Twice as slow as most versions of the Sonata in C major�s 2nd Movement, Richter defies expectations by playing twice as fast as the norm in the G major�s Andante. My favorite recording of the G major comes from Emil Gilels who creates a wonderfully mysterious staccato attack of chords in the Andante. Somehow, Richter manages at a very quick pace to retain the music�s mystery while also supplying a jaunty rhythm that is quite positive in mood. 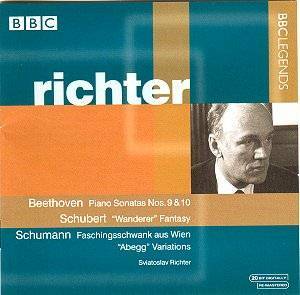 Schubert�s "Wanderer" Fantasy � My standard over the years has been Richter�s EMI performance in Paris recorded just a few months after his London performance. Clifford Curzon�s Decca recording of 1949 is supreme in conveying Schubert�s singing lines. Richter however is also exceptional in this regard and in addition conveys the demonic and impetuous qualities of the music in a more pronounced manner than Curzon. There isn�t a great deal to choose between the EMI and BBC Richter performances. He is a little more spontaneous and wild in the BBC reading, but the EMI offers much better clarity and immediacy of sound. Schumann�s "Abegg" Variations � Although of more immediate than lasting pleasure, this is an excellent work as Opus 1s go. Consisting of a theme, three variations, intermezzo and finale, the piece has plenty of structural variety and displays Schumann�s total command of the piano�s resources. Clara Haskil on Philips imparts a strong and stern drama to the music, but I prefer Richter�s more idiomatic approach stressing the music�s tenderness and positive moods. For an exceptional modern era recording, I recommend Daniel Blumenthal who offers a delicious and sparkling rendition on a Calliope disc. Schumann�s "Carnival Jest from Vienna" � Richter�s EMI performance of 1962 in Italy has long been considered the best version ever recorded. From my perspective, the London interpretation surpasses it with room to spare. An absolutely riveting performance, Richter is more exuberant, poignant, and spontaneous than in his EMI recording. Especially outstanding is the portrayal of the various personalities in the 1st Movement Allegro where Richter offers greater coherency among the extremely divergent souls than in any other version. Best of all, this is the version that most conveys a "Carnival Jest". Chopin�s Etude in C sharp minor � Among the many other recordings I own of this work, Richter�s is clearly the fastest. It is a feat of vituosity, but I�m not convinced that the tempo allows the music to breathe sufficiently to bring out its demonic qualities or coherency. I remain loyal to the Horowitz on RCA, Pollini on Deutsche Grammophon, and the Ashkenazy from 1959 on Melodiya. These three versions reign supreme with their slashing rhythms and great concentration of energy. In conclusion, this new BBC disc from Sviatoslav Richter is a compelling portrait of one of the towering musical artists of the past century. The recorded sound is not up to par, but Richter transcends such mundane considerations. To add to the disc�s rewards, we get the most rewarding version of Schumann�s "Carnival Jest from Vienna" on the market. Needless to say, the disc is strongly recommended to all piano enthusiasts as well as fans of the composer.